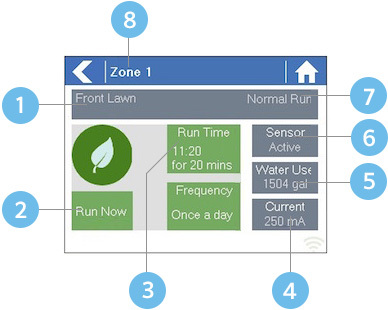 You can run an irrigation zone on demand from the HC Controller or from your web browser / smart phone / tablet. From the Home screen navigate to the Zone Summary screen by pressing Zones. The Zone summary screen shows the status of 6 zones at a time. To view the next or previous group of zones use the Next and Previous buttons. The current range of zones that you are viewing is indicated at the top of the screen. From the Zone Status screen you can manually start a zone using the Run Now button. When started, the zone will run for the zone’s default configured run length. This can be overridden by clicking on Run Time prior to manually starting the zone. You can also stop a zone from running for an extended period of time by using the Suspend button on your Dashboard. Zones can be stopped from running for up to a year and will be shown in your dashboard as partially greyed-out icons. TIP! To cancel a zone that’s already suspended just click on the Suspend button again and choose the Cancel Suspension option. Once you’ve done this the zone will run at the next scheduled watering time. From the web or app Dashboard click or touch the zone icon you wish to run and click the Run button. Select the length of time to run the zone for and click OK. The zone will start running within a few seconds. You can also run all zones in sequence by clicking on the gear icon just above all the zones as shown below. 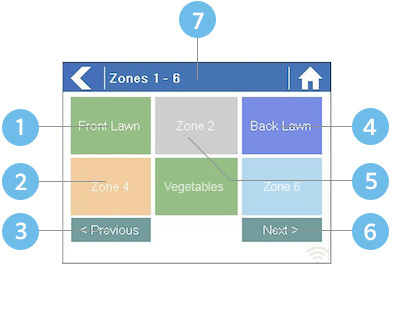 The zones can be run for a specified length of time or can run for their normal programmed time. TIP! To stop a zone that is currently running just click on the Stop button on your dashboard. It is also possible to run a full program without needing to run each zone individually. To run all configured zones move your mouse to the Controller Status icon and press the Run button. Zones can be run for the standard program time or a custom time.